Dave reflects on Duke School's common values in the wake of the events in Charlottesville and Durham. We held our first employee meeting of the 2017-18 school year this week. While the joy of starting a new year was evident, a solemnity pervaded the room as people continued to process the events of Charlottesville and Durham. We all agreed that education is more important than ever in times like these. We also agreed that it is necessary to articulate and embody our shared value system in order to effectively support and guide our students. Those common values are noted below. Equity matters. No one will be judged by their race, religion, sexual orientation, gender, gender identity, age, or socio-economic background. If Duke School is to be a model of equity and justice, this tenet is foundational. Facts matter. We know that there are facts and they can be articulated and identified. Part of our work is to help students understand how to unearth facts and be able to distinguish between facts and propaganda. Humility matters. No one has a monopoly on the truth. We need to understand that about others and about ourselves. Civility matters. We must listen to one another and respond respectfully. While we need not agree with one another, we do need to act civilly. Finally, logic matters. When one has the facts and looks at them with an open mind, one will come to a good understanding which can then be communicated civilly. These values guide the work we do to help students become problem solvers for our complex world. Last August, Smokey Daniels and Sara Ahmed, authors of Upstanders, kicked off our year by helping teachers give students the tools to engage their hearts, as well as their minds, in inquiry-based problem solving and how to make a positive difference. That work continues as does our work on equity, justice and empathy. If you are wondering how to talk to your kids about these incidents, here is an article from the Los Angeles Times that might be helpful. An old Chinese tale talks about living in interesting times. 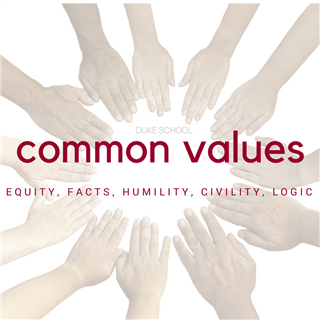 These are indeed interesting times and by honoring these values, Duke School is well positioned to allow our students to flourish in them.